Contemporary American society, with its emphasis on mobility and economic progress, all too often loses sight of the importance of a sense of “place” and community. Appreciating place is essential for building the strong local communities that cultivate civic engagement, public leadership, and many of the other goods that contribute to a flourishing human life. Do we, in losing our places, lose the crucial basis for healthy and resilient individual identity, and for the cultivation of public virtues? For one can’t be a citizen without being a citizen of some place in particular; one isn’t a citizen of a motel. And if these dangers are real and present ones, are there ways that intelligent public policy can begin to address them constructively, by means of reasonable and democratic innovations that are likely to attract wide public support? Why Place Matters takes these concerns seriously, and its contributors seek to discover how, given the American people as they are, and American economic and social life as it now exists — and not as those things can be imagined to be in some utopian scheme — we can find means of fostering a richer and more sustaining way of life. The book is an anthology of essays exploring the contemporary problems of place and placelessness in American society. 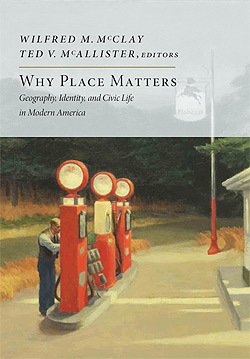 Edited by the historians Wilfred M. McClay and Ted V. McAllister, Why Place Matters includes contributions from distinguished scholars and writers such as poet Dana Gioia (former chairman of the National Endowment for the Arts), geographer Yi-Fu Tuan, urbanist Witold Rybczynski, architect Philip Bess, essayists Christine Rosen and Ari N. Schulman, philosopher Roger Scruton, transportation planner Gary Toth, and historians Russell Jacoby and Joseph Amato.